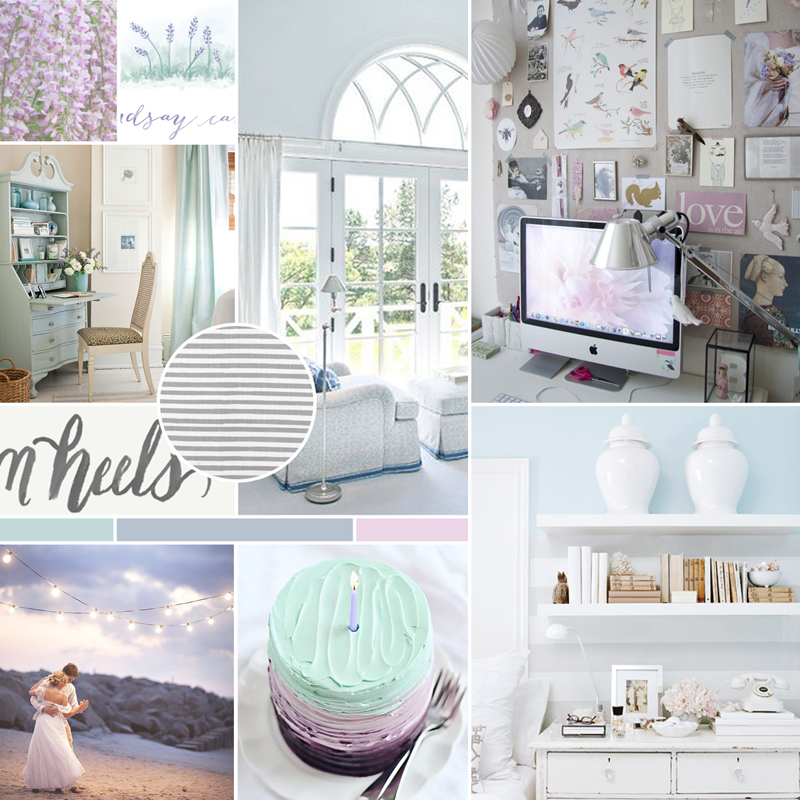 I’ve got another moodboard to share with you guys today! This dreamy collection is for another interior designer (I’m on a roll!) The brand words we came up with were charming, dreamy, and romantic, and they’re looking for soft blues, grays, and lilacs. We’re also including some painted lettering in this project, which I’m SO excited about! I love making moodboards! And this one is so dreamy. I have a question for you though- I’ve been wanting to put moodboards such as this on my blog but I’m worried about copyrights and people getting mad for using their photos. And I’ve read that simply citing Pinterest isn’t enough (and I agree with that). So I guess what I’m asking is, do you find these images on Pinterest, then click through and find the source and just simply link it from there? Also, do you ask permission from the original artists/sites first? I know a lot of people don’t mind others posting a pic of theirs as long is there is attribution/a link back to the source. I just want to make sure I’m doing the right thing when posting inspirational images like this! I’d love to hear your thoughts on this. Thank you! This is SUCH a great question, Kayla! I actually wrote a post about this issue a while ago, and you’re on the right track. If I’ve found the original source and don’t see anything blatant on there that the image isn’t available to use elsewhere, then I link to the source and call it a day! For moodboards and Pinterest specifically, I have a pretty strict policy of only pinning images that link to the original source, so that definitely comes in handy when I go to make moodboards (I touch on that a little here.) I usually start a new note in Evernote and paste the URLs of the images in there as I download images so that I can go back there and pull them into the post. Worst case scenario, if there’s an image that I have to use (like the client provided it or something) and I’ve exhausted all options, I will sometimes use the image and just say that I couldn’t find the source, and ask that if someone finds it that they let me know. There are instances where the original source legitimately doesn’t exist anymore, like when websites expire and are no longer visible. Hope that helps, sorry for the novel! Let me know if you have any other questions! Wow, thank you so much! That was a great response, I’m glad you wrote a novel! Haha. That’s a really good idea of always clicking through to make sure an image on Pinterest has an original source, a lot of them tend to be pinned from tumblr or random sites that aren’t really legitimate. I do photograph all my own photos for my blog except when it comes to inspiration, so this information is great! Thanks again so much! I will check out that linked post as well.